A few months ago, I recommended David Quammen’s illustrated edition of Darwin’s Origin of Species. 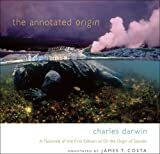 Now another edition has come to my attention: “The Annotated Origin: A Facsimile of the First Edition of On the Origin of Species“ edited by James T. Costa, a biologist at Western Carolina University. This edition pairs a facsimile of the first edition of 1859 with annotations by Costa which provide elucidation of the text using both historical and modern information. It has been used both in Costa’s course on Origin at WCU and in Harvard’s Darwin Summer Course at Oxford. The annotations look very useful for clarifying the nature and structure of Darwin’s argument. A brief introduction, a coda, and biographical notes are added. All in all, this edition looks very useful for classroom use, though the $35 price tag is a little too high. Hopefully Belknap Harvard will produce a paperback edition. A further edition, edited by historian Jim Endersby, is to appear at the end of this month. At $115 it is even more expensive, and I currently have no clue as to what scholarly apparatus is added. This entry was posted in Books, Evolution, History & Philosophy by John M. Lynch. Bookmark the permalink. There is an extensive intro, explanatory notes, a biographical register of everyone named in the Origin, an appendix analysing the major changes Darwin made to the successive editions, an up-to-date bibliography, and a new index (prepared by a professional indexer — a rarity these days!). Thanks Jim. Look forward to seeing it.